There are a few varieties of bebotok in Indonesia. They are made with minced fish, lamb or beef, and maybe even chicken, I’m not sure. In this recipe, I use beef (sapi). These yummy meat parcels are typically steamed in pandan or banana leaves — I had neither on hand last night, so I used foil. I’m sure the fresh leaves add to the aroma, but I think mine turned out just fine. These are delicious, and I hope you’ll give them a try tonight! In a medium bowl, mix together beef, onions, garlic, salt and pepper. Set aside. Heat wok over high heat. Add coriander, cumin, ginger, chilies, candlenuts and lemongrass; stir-fry for 1 minute. Add beef mixture, and brown for 5 minutes — stir constantly to break meat up. Add the coconut milk, lime leaves and tamarind water, stirring well. Reduce heat to medium, and simmer until mixture is just about dry, about 20 minutes. Remove meat mixture from heat. Transfer to a bowl and let cool, about 10 minutes. Meanwhile, slice the hard-boiled eggs. Cut sheet of aluminum foil into 14 7″X7″ squares. Place 1 egg slice in the middle of each square. 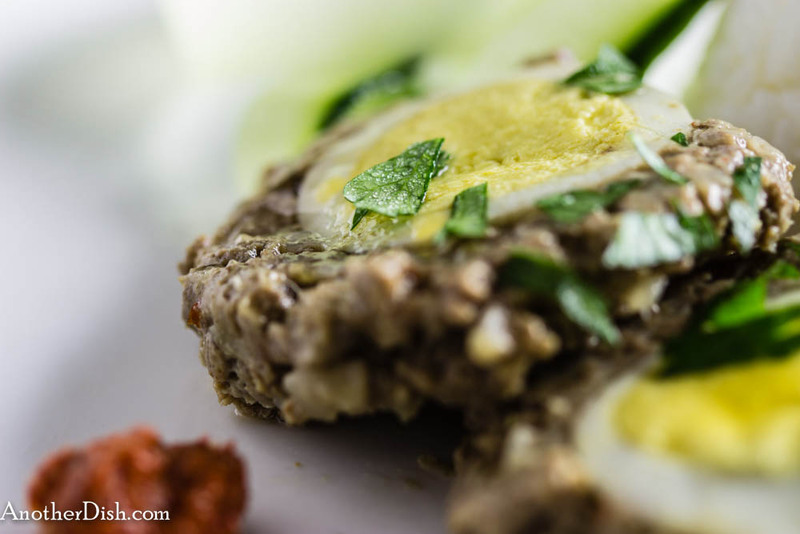 Stir beaten egg into meat mixture. Spoon 2 heaping Tbsp of the meat over each egg slice. Fold opposite sides of the foil in over the meat and egg, sealing the parcels into squares. Prepare a steamer — I used a large, shallow sauce pan, placed a cooling rack in it and filled the bottom with water, just below the rack. Place the meat parcels evenly into the steamer. Cover and simmer for 30 minutes. Remove meat parcels from steamer. 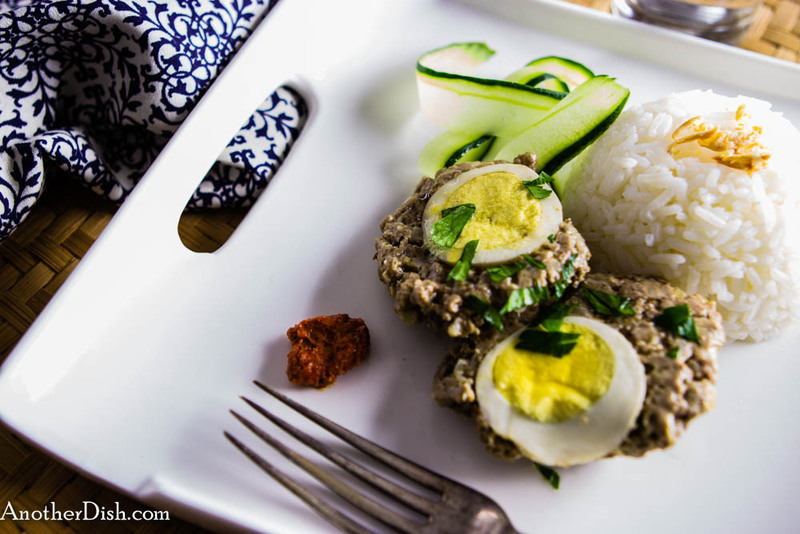 Serve with steamed rice, sliced cucumber and an assortment of your favorite Indonesian sambals. This entry was posted in Beef, Indonesian, Main Dishes and tagged Chilies, Cooking, Eggs, Food, Food Photography, Foodie, Indonesian, Indonesian Food, Recipes, Southeast Asian Food, Spicy on March 2, 2014 by AnotherDish. Sounds good, especially with those spices! Thanks! I think it tastes much better than it looks (not so happy with the photography on this one).